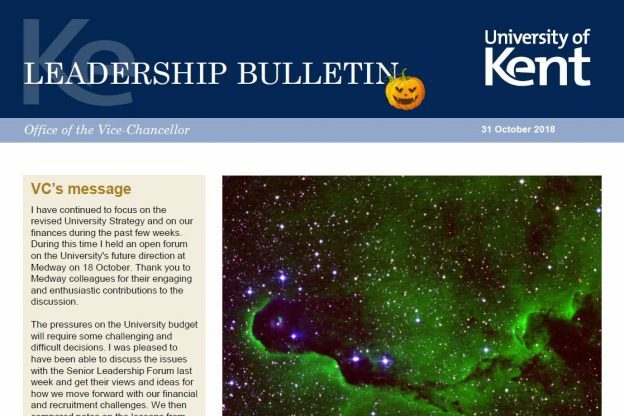 The latest issue (31 October 2018) includes a summary by our Vice-Chancellor and President Professor Karen Cox of discussions held at the latest Senior Leadership Forum including the University Structures Project as well as her visit to the University’s Beacon Observatory. There is also an update on Executive Group meetings, information on KentVision from Senior Deputy Vice-Chancellor and Provost, David Nightingale plus an analysis of the Autumn budget. This entry was posted in Campus online on 1 November 2018 by Miles Banbery.